Posted on Friday, July 5th, 2013 at 8:44 am by Pieter van der Westhuizen. The Mail Merge functionality in Microsoft Word is one of the most powerful features that enables you to create, amongst other things, simple form letters. It is, however, one of the tricky things to get your head around when trying to automate it in either an Office add-in or a stand-alone application using the Word Object model. 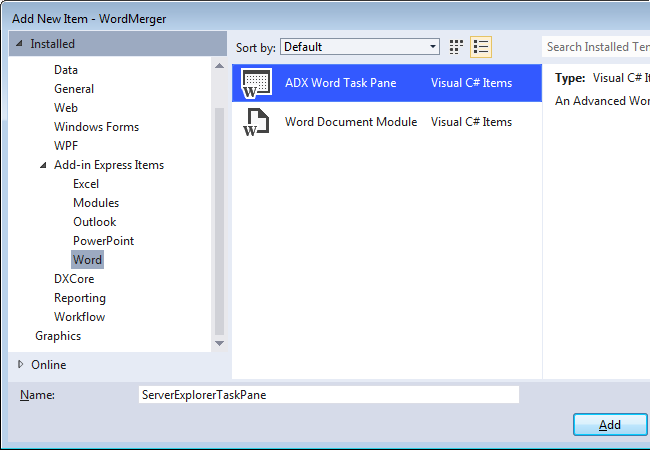 In this article, I’ll guide you through creating a Microsoft Word add-in that will make it easier for the user to create Word merge documents that incorporates data from a SQL Server database. 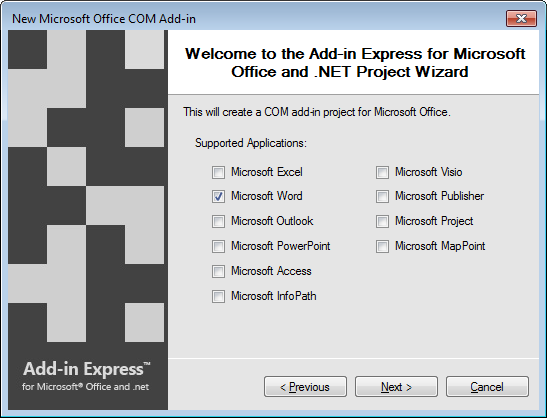 To start, create a new ADX COM Add-in project in Visual Studio (2012, 2010, 2008 or 2005) using Add-in Express for Office and .net. Select you programming language of choice and minimum supported version of Office. In this example we’ll be using Visual C# (VB.NET and C++.NET are supported as well) and Microsoft Office 2010 and above. Since, we’ll only be working with Word, select Microsoft Word as the only supported application. 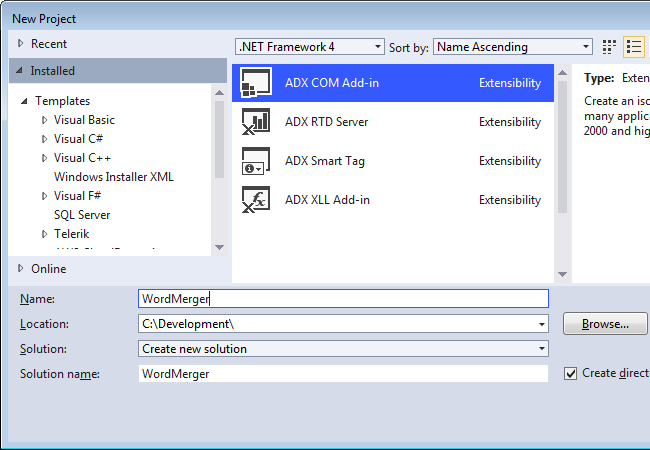 After the Microsoft Word addin project has been created in Visual Studio, add a new ADX Word Task Pane item to you project. 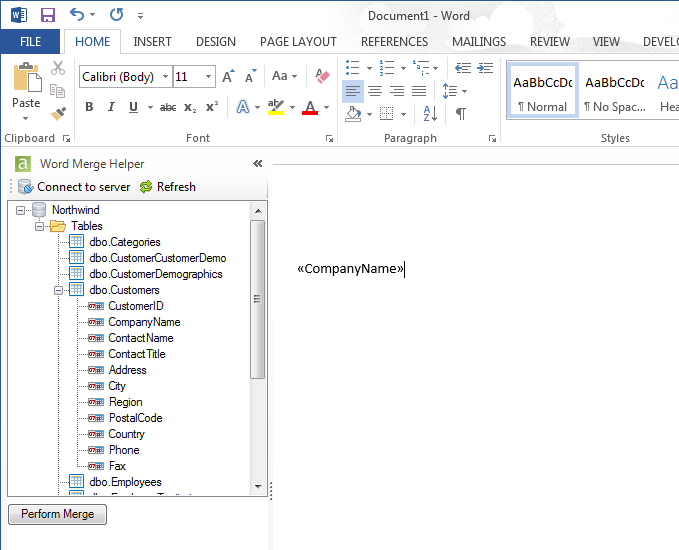 You can find the template for this item under Add-in Express Items > Word. 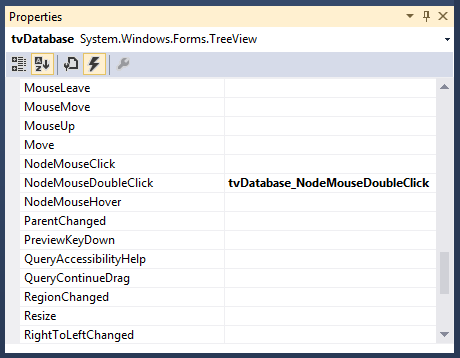 The above code will display the Windows data connection dialog and display all the database tables in the database the user selected. You can download the source code for this dialog from MSDN. Next, we need to add the code to load all the columns of the table the user would be able to double-click on. To do this, select the tree view control in the Visual Studio forms designer and double-click next to its NodeMouseDoubleClick event in the properties window to generate an event handler. 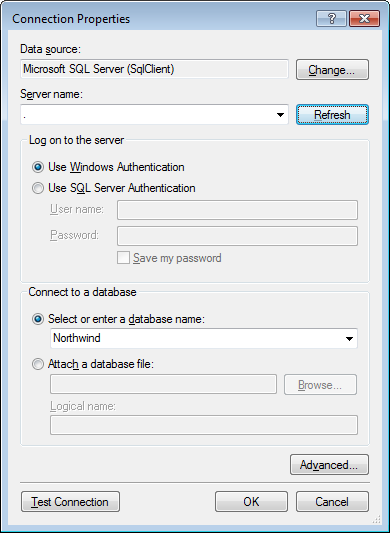 The code above checks whether the user clicked on a table or a column name. If the user double-clicks on a table, it will add the tables’ columns as child nodes, as illustrated below. And if the user double-clicks on a column node it will add the column name to the active Word documents’ MailMerge fields. The above code, builds a SQL selected query as well as a connection string to the selected server and database. It then executes the OpenDataSource method of the MailMerge object. The first parameter is the path to an Office Data Connection (.odc) file, which we created by calling the CreateODCFile method. Most of the other parameters for the OpenDataSource method can be set to a missing object, except for the Connection and SQLStatement parameters. All that is now left to do is to set the destination of the mail merge – in this case a new Word document – as well as to call the MailMerge objects’ Execute method. You can also choose to set the destination of the mail merge to either print the documents or send the results to e-mail. 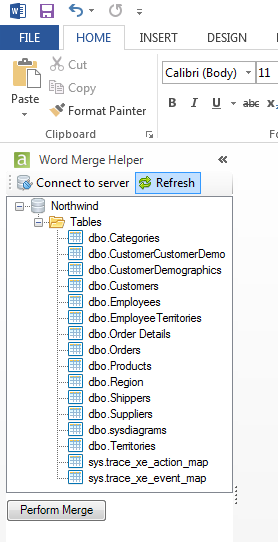 The final result should be a document with a letter for each customer in the Northwind database. Please see the included sample project for a complete working example of the project I’ve explained in this article. ASP.NET MVC & Twitter Bootstrap project templates and wizards. What if? good morning, thanks for the input, download the add WordMerger, but I can not load it into word. I tried to load the file in “… \ Loader \ adxloader64.dll” but doing word tells me that is not a valid office add-in. That I can do to load it. Greetings. Do you have Add-in Express and Visual Studio installed? 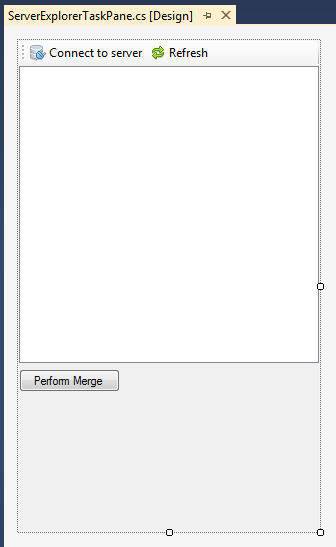 Performs a simple insertion of data into merge fields and sends the document to the browser inline. // Send the document in Word format to the client browser with an option to save to disk or open inside the current browser. // Executes a mail merge with repeatable regions. 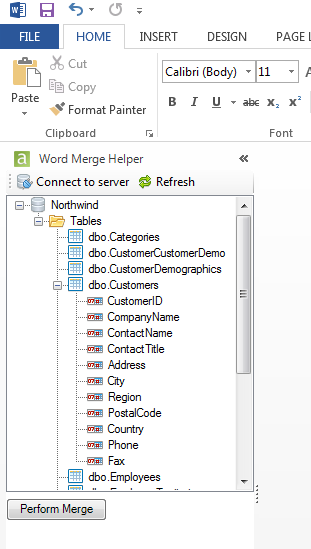 // Instead of using DataTable you can create a DataView for custom sort or filter and then mail merge. /// executes the command and return the result in a DataTable. Its exactly what i want but i have a doubt, what is this? But when i debug this variable wordApp is always null so at the end it gives me the error : object not reference not set to an instance of an object. Where do you try to access the WordObjApp object? It is only available on the ADX TaskPane.